All this week we're rolling out our annual awards for best new automobiles, with us unveiling our favorite sports cars yesterday. To suss out the best of the best in every category, we prowled the earth's byways, from twisty roads in China to hilly thoroughfares in the south of France to the clogged intersections of Los Angeles and Chicago. Now, we'll let you know what made the cut. Today, behold the best sedans of 2014. The sell is simple: a Mercedes-Benz for less than $30,000. 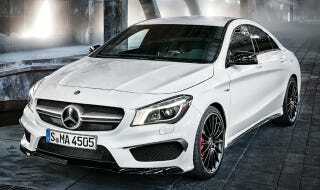 When we first heard news of the CLA, we found the idea scintillating. Could M-B steal away Chevy and Toyota buyers with a small, affordable sedan? Then we saw the thing. The "predator-like exterior" and "airplane-cockpit-inspired interior" (as the car's product manager, Heiko Schmidt, puts it) had us at hello. We put the car through its paces in the hills of France's Côte d'Azur, then tried it out as a commuter at home. The two-liter turbo and seven-speed dual-clutch automatic don't provide the thrills of more expensive M-B models, but they match anything in the price range. And the standard start-stop and collision-prevention assist are nice touches. In a perfect world we'd go for the AMG version (pictured, $48,375). But the base CLA is a big winner in its class. At that price, you can buy his and hers. If the luxury-auto biz were a football game, the CTS would be America's QB against the German juggernauts. Named Motor Trend's car of the year, the new CTS is visually stunning inside and out. The base two-liter turbo in-line four options up to a $70,000-plus car with a 420-horsepower, 3.6-liter twin-turbo V6. Bottom line? This is an all-star athlete. With its "sportback" roofline and the eyes of a comic-book mastermind, the A7 is a design triumph for the ages. The new RS version packs a four-liter twin-turbo V8, making this 560-horsepower lightning bolt the most powerful production Audi ever. It can do zero to 60 in 3.7 seconds (that's Ferrari territory), tops out at 174 mph and is roomy enough to lug six kegs of Franziskaner Weissbier. Sold! The newly imagined Mazda 3—available as either a hatchback or a sedan—is lighter on its toes, longer in its legs and easier on the eyes. You can't argue with these numbers: 155-horsepower Skyactiv two-liter in-line four, 30 city and 41 highway mpg, and a top speed of 130, all for a base price of less than $18,000. The nav system and rear cross-traffic alert come standard, and with a stiffer chassis, the ride is a blast. Look out, Ford Focus, the competition is heating up. Check back Wednesday, when we unveil our 2014 Green Car of the Year.